You go girl! Singer Katy Perry led a chant at the Women’s March and it was pretty epic. On Saturday, the Women’s March made a powerful statement through women’s strength, solidarity and amazing signs. At the march, which took place all over America and the world, featured some pretty big names. Throughout the Women’s March on Washington, celebrities like Amy Schumer, Lena Dunham and Amber Tambyln marched for women’s rights. 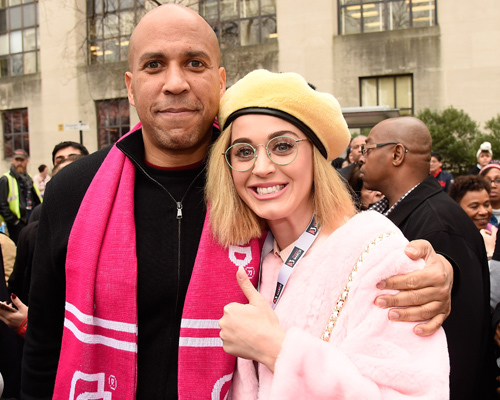 The “Roar” singer, who is very vocal about politics, was also in Washington D.C. for the big event and she even took lead on an awesome girl-power chant. "What do we want? Equality!" Perry yelled while walking with hundreds of women. All women want is equality, and we definitely want it now! During the march, Perry not only joined forces with regular women who are trying to make a difference but she also spoke with Gloria Steinem, who is a feminist activist, organizer and writer. "Today a feminist got her wings. Thank you @gloriasteinem ❤," the singer captioned her photo with the legend. Thank you to everyone who marched, including the “Dark Horse” singer. We salute you ladies and we support you!